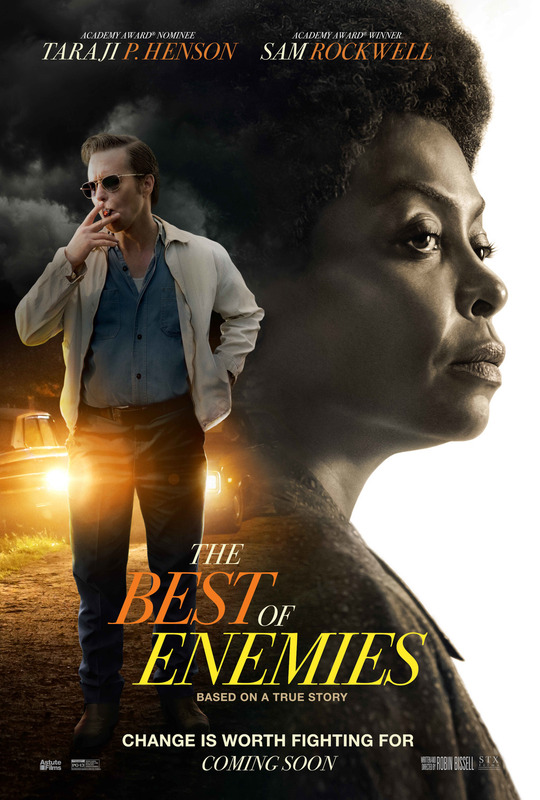 Another movie based on a true story that features the strife between the races came out this weekend called The Best of Enemies, with Sam Rockwell, who seems to be making his career on playing racists, and Taraji P. Henson. The story of C.P. Ellis (Sam Rockwell), the local president of the Klu Klux Klan, and Ann Atwater (Taraji P. Henson), local civil rights activist, come together in Durham, North Carolina to deal with the issue of school integration in 1971. After a black school was burned in a fire, the question of where the black children would go to school caught the attention of Atwater and the NAACP. A judge, unwilling to make a controversial decision, ordered the locals to go through a charrette, or a summit, led by African-American Bill Riddick (Babou Ceesay), where both sides of the issue would come together to voice their thoughts. Both Sam Rockwell and Taraji P. Henson were excellent in their roles. They felt like real people and not just the Hollywood version of these characters. The performances of the film were the strongest part. Another shout out should go to Anne Heche, who played C.P. Ellis’s wife, Mary, who had some short, but important character moments. The film was predictable, but that is not always a bad thing. Here, since this is a true story, you can forgive the predictability of the film. The biggest issue I had with the movie was that I did not quite buy the turn around by C.P. He went from a man who hated the black people, going as far as to shoot up the house of a woman reportedly dating a black man, to a man who doesn’t hate black people. While there are some of the plot points that are used that are meant to change C.P.’s mind, I just did not find them convincing. The film seems interested in the Klansmen more than anything else. It is clear that these Klansmen did not see themselves as the villains of this movie, and there is something interesting in seeing what is a “good” man in an organization that deals with hate, but that was not handled enough here to make it a theme. I will say that the emotional wallop is not as powerful as it is played on screen, but there are some fine scenes with Henson and Rockwell. I think that this would be more believable if we saw some questions in C.P.’s mind prior to duking it out with Atwater over integration. He just seemed too opposed to be swayed as he was. Not too bad overall, but not a must see.